A friend of mine shared a link to a video clip about the making of the tomb of King Richard III on Facebook. I’d like to share the link here with you as I know that some of our readers are not on Facebook, but would also be interested. Having seen the tomb face to face, I have to admit I never realised how much detailed and fine craftmanship was involved in bringing out the beauty of the stone so impressively. ‘Richard III: The Burial of the King’ on SBS! Thank you to our friends of the Canadian Branch of the Richard III Society! They alerted me to an article in our paper, the Sydney Morning Herald, that SBS is showing ‘Richard III: The Burial of the King’ on Friday. This documentary, hosted by Jon Snow, shows the Reburial Service, in which Richard III was laid to rest in Leicester Cathedral on 26 March this year. I was lucky enough to watch the service live on TV in the UK, in the company of other members of the NSW branch. This is a programme not to be missed by anyone interested in this king. And a ‘Thank you’ too to Ben Pobjie of the Sydney Morning Herald, for giving Richard III a more balanced write-up than what is frequently found in the media. We are most grateful to Frances Perry, who made this fascinating view of Richard III’s reinterment through the eyes of re-enactors available to the NSW Branch of the Richard III Society. Just click on the link below to read it! At our February 2015 General Meeting, the NSW Branch decided to support Leicester Cathedral’s King Richard III Appeal with a donation of $1000. So in the morning of 24 March, two of our branch members, Treasurer Judy and Webmaster Dorothea, who were in Leicester during Reinterment Week, met the Revd Peter Hobson at Leicester Cathedral and handed our branch donation to him. The Revd Peter Hobson thanked all members of the NSW Branch in the name of Leicester Cathedral. Judy and I were both, along with lots of other Ricardians from all over the world, very impressed with the thoughtfulness and respectfulness which had been shown to Richard by Leicester Cathedral and the City of Leicester. Judy and I had each attended a different service at the Cathedral and both had had been very moving. I had attended the Memorial Service for members of the Richard III Society and cannot thank the cergy at Leicester Cathedral enough for giving us the opportunity to remember Richard III in such a heart warming ceremony. I heard several people comment afterwards that this had been for them THE memorial for Richard III, a sentiment with which I agree wholeheartedly. Thank you Leicester Cathedral for all that you have done! Our donation might be small considering the costs of Richard’s reinterment, but expresses our support for what Leicester Cathedral has achieved. 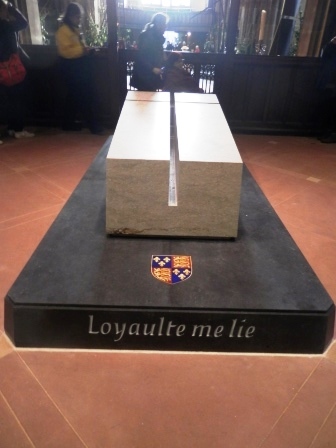 The following is a personal account of the Richard III Reinterment Week in Leicester in March 2015 with links to sites that will offer those who could not be there in person a glimpse of what it was like. The comments made here reflect the personal views of the author. Let’s start with links to watch two of the services during Richard III Reinterment Week online, or those who were there might like to watch them again. It was a dignified and moving service. I was able to watch it on screen live with several others of our branch members from NSW. It was an overcast grey morning with drizzle, but at the moment when Richard’s coffin was lowered into the ground the sun broke through. The Service of Reveal of the Tomb took place on 27 March. I was able to visit the tomb on that Friday afternoon. Judging by the pictures published before, I had not been sure whether the tomb would work, but seeing it in reality is as always different. To me it felt absolutely right and part of the Cathedral. The floor tiles with inlaid Yorkist roses was a nice touch. I have not been able to find any recordings of the Society Memorial Service on 23 March, and actually do not think that there are any. I had been lucky in the ballot and received an invitation to this beautiful service. From where I was seated my view of the proceedings was obscured, but I had a clear view of the main part of the service, the coffin of Richard III. It was covered with a beautifully embroidered pall, on the one side displaying on the one side figures from the 15th century and on the other side figures involved in the 21st century discovery of the King’s remains. The Choir sung In Memoriam: Ricardus Rex by Graham Keitch, a beautiful rendition of the music, which many of us remember from the 2013 Australasian Convention in Sydney, though there can be no doubt that to listen to it in a church sung by an outstanding choir beats a recording played over a loudspeaker system. Several of those attending remarked afterwards that this was the optimal service for them to remember and reinter the King, a sentiment I can only share. The Reinterment Week started with Richard III Leaving the University of Leicester on 22 March. You can watch the full ceremony here: https://youtu.be/C4-8utmsESo. I was able to watch the cortege returning to Leicester in the afternoon and was more than impressed by the friendly and truly multicultural atmosphere displayed by all who waited for hours along the route. In the evening of Thursday, 26 March, I was able to attend – along with hundreds of Society members from all over the world – a rendition of the Middleham Requiem by Geoff Davidson. The music was stunning and the soloists and choir exquisite. The recital was attended by HRH the Duke of Gloucester and two of our branch members had the honour of being presented to His Royal Highness. The Richard III Reinterment Week concluded with the Leicester Glows Event in the evening of 27 March, a compilation of which you can view here: https://youtu.be/viI2lXBS2Os. Watching it on screen is not the same as watching it in real life, but I hope you can feel some of the atmosphere of reflection in the lights and of the excitement of the fireworks. Don’t forget that the Orders of Service of the Service of Compline, the Service of Reinterment and the service of Reveal can be bought from King Richard in Leicester at the set price of £ 12.50 + p&p (so don’t pay for overpriced copies on ebay!). Or you can print off your own copy at this link. This was a week like no other and I am sure I’m not the only one who feels that I still have to come down to earth after all these experiences. During the week, Richard was also reunited with his Book of Hours, about which I had written on another site (https://dottietales.wordpress.com/2015/02/23/the-book-of-hours-of-richard-iii/ ). At the time of writing that blog I had not been able to anticipate what a profound experience the Richard III Reinterment Week would be. I would also like to take the opportunity to congratulate all at Leicester Cathedral and in Leicester itself on their hard work, which made this wonderful occasion possible. Everyone did a fantastict job in laying King Richard to rest with dignity and honour. Late this afternoon, at least for us in Eastern Australia, BBC Radio 4 transmitted as part of their ‘Sunday’ programme on the Reinterment of King Richard III at Leicester Cathedral in March 2015. My congratulations go to the Revd. Pete Hobson, Acting Canon Missioner of Leicester Cathdral, Dr Phil Stone, Chairman of the Richard III Society, and Father Andrew Cole, Spokesman for the Catholic Diocese of Nottingham, for explaining their stance in the face of certain allegations so succinctly. I personally have no doubt that Richard will be shown all respect and dignity where these men are involved. And am looking very much forward to being able to be in Leicester for Reinterment Week. Of course, I am hoping, like tens of thousands others, for a seat in one of the services, but won’t mind watching the the re-interment on the big screens either. The atmosphere will be worth the trip. You can listen to the programme here, the discussion about Richard’s reinterment is approx 20 minutes into the programme. Good news. There will be various services at Leicester Cathedral to commemorate Richard III during THAT week in March 2015. About a week ago, members of the Richard III Society received their ballot papers to try and get one of the sought-after seats for one of the services. This ballot offers another chance to win a ticket for one of the services. As this ballot is open to the public, it does not include the special service for members of the Richard III Society on Monday, 23 March (7.00pm). As Revd. Pete Hobson, Canon Missioner and Project Manager, explained on Facebook, “anyone can enter the ballot, for one, two or all three services, but each person will only be selected once and we can’t guarantee for which service if you out in for more than one”. They will also coordinate the allocation of tickets from their ballot with that of the Richard III Society, so that no one gets “double invites”, thus allowing as many people as possible to have a chance to attend one of the services. Revd. Pete also mentioned that they hope to open the Cathedral to the public by mid-afternoon on Friday, 27 March, to pay their respects at the tomb. The ballot will open on Friday 12th December, 100 days before the week of events, at 8.00 am (UK time), which is 5.00pm AEST, and close at midday (9.00pm AEST) on 31 December. The lucky ones who will be invited, wll be notified by letter, which are expected to be sent out in the week beginning 12 January. This is the same week, when the Richard III Society will notify those members, who were successful in being chosen. My ballot papers for the events in Leicester surrounding Richard III’s reburial in Leicester in March 2015 have arrived today. The completed papers will have to be returned by Wednesday, 7 January 2015. I will fill mine in and send them back as soon as possible and hope they won’t get stuck in the Christmas rush. Wishing all our members who are able to make the journey to Leicester lots of luck. It has just been announced that both the Cardinal Archbishop of Westminster and the Archbishop of Canterbury will be taking part in services in Leicester Cathedral to mark the reinterment of King Richard III. The Cardinal Archbishop of Westminster is the most senior clergy of the Catholic Church in the UK and the Archbishop of Canterbury is his counterpart in the Church of England/Anglican Church. Since Richard’s remains were found two years ago, the Anglican Diocese of Leicester has worked closely with the Catholic Diocese of Nottingham, which includes Leicester, to ensure that the reburial will be handled with dignity and honour. Anglican and Catholic clergy will celebrate at major as well as other services during the week 22 to 28 March 2015. At the reburial service on 26 March, other Christian denominations as well as the World Faiths will be represented. It has been occasionally been said that Leicester Cathedral is too modern for a medieval monarch. While it is true that its modern Cathedral status is relatively new (1927), there were already Bishops of Leicester from the 7th to the 9th century. The actual church was built by the Normans, replacing an earlier Saxon church. The Norman church was rebuilt and enlarged during the 13th and 15th century. So we can assume that Richard would have been very much aware of the church during his visits to Leicester. You can find the full schedule of the planned services here. Probably not all of us were able to listen to the actual press conference where the date for Richard III’s reburial was announced. However, as with radio we don’t have the same regional limitations as with TV programmes, you can listen to the programme on Radio Leicester again. The chairman of the Richard III Society, Dr Phil Stone, is also speaking.